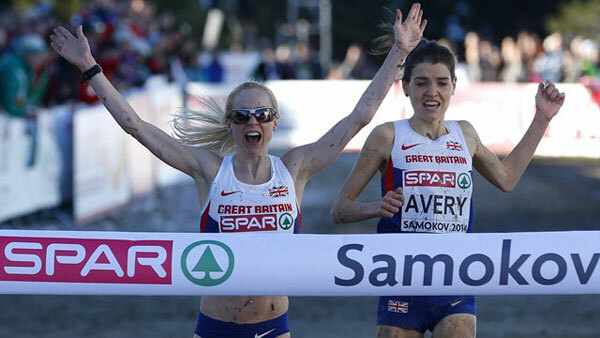 Euro Cross Country Championships – A thrilling, nail-biting women’s senior race was won in a sensational sprint over the final strides by Gemma Steel as she beat her Great Britain teammate Kate Avery in a duel that you could not take your eyes off. We were treated to something special as Steel, the silver medallist a year ago and a double team champion at the event, won the individual title she had been craving. She had also won individual bronze in 2011 but this time, she saved just enough to make it home from Avery as the pair shared the same time of 28:27 over the 7.7km course. That was how close it was with Sweden’s Meraf Bahta third in 28:52, again the same time as Almensch Belete, of Belgium, in fourth with two former champions next. Sophie Duarte, the defending champion from France, was fifth in 28:28 with Ireland’s Fionnuala Britton, the champion in 2011 and 2012, sixth in 28:59. It showed the standard of this race where Britain won the team gold with 21 from Spain with 70 and Ireland with 87. But what a clash it became between Steel and Avery. Avery is based in the USA where in Terre Haute, Indiana, she won the NCAA title and by the fifth of the eight laps, Steel and her could not be separated at the front. Spain’s Trihas Gebre had been among the leading women and then Duarte moved closer again in a race where one of the pre-event favourites, Portugal’s Sara Moreira, who was third in the New York City Marathon last month, pulled out after only eight minutes. But at the bell, it was the two Britons at 24:30 who were 17 seconds ahead of Duarte and now it was a case of who would have enough on a course where the early part of each of the six long laps provided the athletes with the test of keeping their balance because it was downhill. Then, with the sun shining and the snow melting, each runner was jostling for the better position out of the increased mud and onto the flatter, dryer part. First Avery looked the stronger, then with 600m left it was Steel, who had the better speed, who took over. Avery moved back in front and as the line approached, victory looked hers until Steel came past her on the outside with a final surge that brought a glorious win. Steel said: “I can’t believe it and I didn’t expect it to be a domestic battle in the end, but we helped each other along. My legs felt weak at the end and though the altitude was kicking in, I just needed to find that extra strength somewhere at the end. Avery was all smiles with her silver medal once her emotions cooled down. 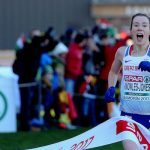 The British pair were backed up in the team gold by captain Steph Twell who was seventh in 29:07 with Lily Partridge 11th in 29:22.